I&apos;ve been in a rut at the gym lately. It seems like no matter how hard I try to incorporate new moves into my workout, I end up with the same cardio and core routine. Yawn. This aversion to treadmills, free weights, and TVs that are permanently set to the Speed channel and MTV has forced me to attack swimsuit season from a different angle. Athens is full of cool, unique ways to get in shape. I&apos;ve listed some of my top picks below. All of these would be great options for this upcoming week, but I would love your ideas as well. This workshop, held at Canopy Studio in Athens, sounds like a blast! No experience is required to come and learn a few basic moves from Canopy&apos;s movement artists. It will be a great workout because it combines strength and flexibility. I&apos;m sure you will use muscles you never knew you had! Hurry and register online for tomorrow&apos;s workshop because spots are sure to fill up fast. This weekly family event caught my eye as an easy way relax and get up off the couch. What could be better than fishing? In an article written for the Athens Banner-Herald, Glover Housman practically guarantees that even novice fisherman will be able to keep the fish biting all evening long. 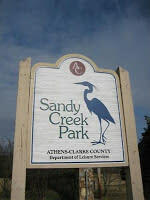 Sandy Creek and ACC Leisure Services will provide the equipment you&apos;ll need. In order to add this event into your workout schedule try biking to and from the park. The State Botanical Garden of Georgia, located off of Milledge Avenue (map), has 8 naturally wooded trails available for hiking. That&apos;s more than 5 miles of trail just waiting to help you get your heart rate up. Print out the handy information on local flora and fauna to help guide your hike. Be sure to bring plenty of water and a camera to document your discoveries. Most of these places offer prizes to teams with the most points. These are usually awesome things like gift certificates or appetizer vouchers. Since there will likely be questions about Athens history and UGA get your facts straight before you go so you cash in at the end. Having a cool team name won&apos;t hurt your chances either. Let me know if you have been to any other places in Athens that are great for getting in shape so we can give them a shoutout too.